At the start of the week, details emerged on a discless Xbox One S to was reported to be announced later this week. During the latest Inside Xbox episode, Microsoft did indeed reveal what is officially titled the Xbox One S All-Digital Edition. 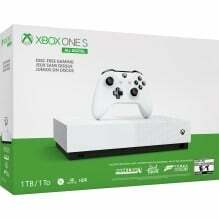 The discless console is available for pre-order now ahead of its release next month, and it will retail for US$50 less than the Xbox One S.
As the name suggests, the white console will not come with a disc drive, instead relying on players downloading all of their games onto the 1TB hard drive. To give players a head start in their game collection, the console will come with Minecraft, Forza Horizon 3, and Sea of Thieves. It will also include "a special offer" for Xbox Game Pass. As the console is a new version of the Xbox One S, it will allow for 4K HDR entertainment but not 4K HDR gaming. The console is available now for pre-order on the Microsoft Store, as well as at retailers such as Walmart, Best Buy, and Amazon. Priced at US$249.99, the console retails at $50 less than the Xbox One S and will arrive on May 7th.